Choosing an appliance is no small decision, not least because of the price tag which these appliances usually carry. It is likely to be one of the most important appliances in your kitchen, keeping food fresh and drinks chilled. Where they used to be considered a luxury, refrigerators and freezers have now long been viewed as a necessity. The fridge has evolved to encompass a vast range of options far beyond its basic uses. It’s important to choose the best product for your kitchen space and family needs. Fridge-freezer combos are the most common type of food storage that people buy, combining both compartments. Usually, the fridge section is larger than the freezers, though the ratios can vary. The freezer section is normally located at the top, bottom or side of the appliance. To help you make the best choice when buying a new fridge-freezer, here is our roundup of some of the best offerings on the market, as well as a helpful buying guide. In terms of dimensions, capacity and annual energy usage, this Zanussi is great for the cost. We love the fact that the the door is reversible, so you can swap it over if you have a bit of a layout change in your kitchen or move home. The compartment drawers in the freezer section are clear too, so you can see what you have at a glance, rather than pulling them out and routing through everything before you do the weekly shop. It has all of the standard and brilliant fast freeze/cooling and auto-defrost functions, and in addition the fridge has some very useful adjustable shelves, so you can alter their heights as needed. This is good, as they are a bit close together for anyone who frequently has their fridge full of goods. We loved the little light guide which tells you the exact internal temperature of the appliance too, so there is no more guessing which setting is perfect and altering it the wrong way. Two separate products of the same quality would cost a lot more, so you get a lot for your money. A spacious, budget-friendly integrated model which has lots of handy features to help make your life easier. Fridge freezers can struggle when it comes to space, but this Bosch integrated model is one of the best options if you want to accommodate big weekly food shops. It has all of the coveted fast-chill, fast-freeze and auto defrost features, and an A++ energy efficiency rating that puts it high on our list. We loved the BigBox addition for the freezer – a deep compartment which will allow you to stack your food prep for the week, or freeze meat and other fragile items without having to cram them in or pile other things on top. The VistaFresh box at the bottom of the fridge also keeps temperatures perfect for your salad to remain crisp, no matter what else is in the appliance. A particularly useful function of the Bosch is the holiday mode. This is a setting designed to keep the appliance running efficiently while using less power. Perfect if you’re off on your summer two week break and there are only a few items left in there for it to take care of. Overall, this model is very quiet and great value for money (despite being at the higher end of the price scale). Think of it as a solid appliance which will see you through several years of demanding work. Another very efficient integrated offering, boasting more capacity than similar models and a bit more flexibility. This Beko integrated model is not only highly efficient (A++), but is packed with features to make life easier too. It offers lots of storage, especially in the upper fridge compartment, and has excellent cooling features. These include a quick-cool function to rapidly freeze items new items. No more rushing home from the supermarket with ice creams in summer and waiting for them to get back down to ideal temperatures. We liked the addition of the bottle rack in the fridge to help free up space in the door compartments while keeping them safe and flat. It will accommodate 2 litre bottles of fizzy pop just as well as wine bottles, and sits just under the top shelf for easy access. An antibacterial door seal will keep your food safe from external germs, and the adjustable shelving ensures you can adapt the appliance to just how you like it and find easiest. The price is fantastic for what you get, as a bonus. A highly efficient integrated product with lots of capacity, and coming in at a wallet-friendly price. This AEG is a spacious, 207 litre, 70/30 split model that is frost-free and fast-freezing. It is a relatively narrow 54 cm wide, making it a good choice for smaller spaces. Yet, it is still an ideal appliance for families which do large weekly shops. This built-in product uses a Coolmatic function to chill fresh food quickly and stop new items from increasing the overall temperature. One of its best features is the half-width flexi door shelf, which you can adjust and move left and right to make room for larger items while still making the most of every inch of available space. The standard shelves are full width and made from safety glass so are strong, while remaining cool to keep your food fresh. We also loves the fact that the interior corners are all curved, so when you need to give it a clean, the cloth will easily get every last bit of surface. Two separate salad drawers will help you keep everything organised, and the freezer drawers are nice and deep (although there are only two). One of the integrated models to make our top list is this compact option from John Lewis, the JLBIFF1810. First things first – this option favours fridge space, so the freezer is actually quite little at only 55 litres (210 litres for the fridge). So if you buy a lot of frozen food, this might not be the best option for you, but if you rely mainly on your fridge for fresh produce it could suit you fine. Having said that, we like how there are three drawers so organisation is clear. This appliance has super-cooling air circulation and adjustable shelves for added flexibility, as well as being frost-free and door-reversible. We love the addition of the wine rack to free up some door space, and the fact that the salad drawer is split into two to keep produce safer. An integrated refrigerator from a reliable name, with lots of space for veg. The Hotpoint HBD5517WUK is a sensible, reliable and reasonably priced choice which would perform well for an average-sized family. When it comes to home appliances, you really can’t go wrong with Hotpoint. The top and bottom sections are almost 50/50 (the bottom half is very slightly smaller) so there is plenty of space for your frozen food, and you don’t have to prioritise one over the other. It doesn’t have an auto-defrost function, which is a shame, but it does have antibacterial liners, adjustable shelves, and the door is reversible so you can choose which way round will work best in your kitchen. It has a glossy exterior that would complement a contemporary look, too, and is easy to keep clean with a wipe. A sleek, sensible family fridge which won’t hurt the pocket too much. The Grundig GKF15810N could be the best choice if you do not mind going without a water dispenser. It’s stainless steel with an anti-fingerprint finish, which means minimal smudging and smearing. The doors are easily reversible, so no matter the set up of your kitchen it will fit right in. Frost-free features mean it will defrost automatically, so you don’t have to waste hours doing it manually. The large salad crisper gives ample storage for your fresh produce, and there is also a wine bottle rack to let you store large 2L soft drinks bottles. Integrated LED lighting lets you see the contents clearly, and there is a dedicated slimline ice cube tray so it is always easily accessed for those cold drinks and smoothies. A reliable and roomy stainless steel appliance with plenty of room for your weekly shop. You’re really in safe hands with Beko appliances. If you’re looking for a great value freestanding appliance that comes with a chilled water dispenser, then the Select CXFG1685DS is a good option. It has an internal water tank, so you’re not restricted by the need to position it close to a plumbed water source. 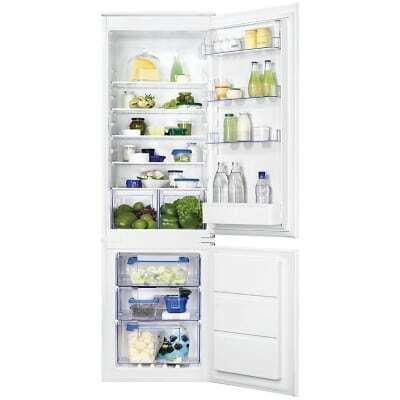 The fridge section is particularly spacious – 225 litres – and auto-defrost means there’s no pesky ice build-up. All in all, this model is cheap and good quality, and its Freezer-Guard feature means that it will continue to perform well even if the room is cold – so it can be used in outbuildings. A great looking, great value unit with built-in water dispenser. One of our favourites. The Siemens KG33VVI31G has a great capacity, lots of little storage quirks and is high in energy efficiency, so was a clear addition to our list of the best fridge freezers available. It has a stainless steel finish, which can be often prone to smudging, however the fingerprint-proof coating helps to solve this problem. A quick wipe down will keep it looking new and shiny. The shelves are fully removable too, and the removable door seal is magnetic so won’t get all grimy and dirty through the years. The bottle rack helps keep your precious glass items safe, and the salad crisper drawer features integrated humidity control so your lettuce and cucumber will stay crisper and fresher for longer. There is a large deep door shelf for your milk and juice cartons, and two shallow options if you store your eggs or sauce bottles in there. It is simple in style and function, but after all, sometimes that is the best way. This modern stainless steel fridge has lots of space and some great functions, as well as looking clean and modern. The retro look doesn’t have to cost you the earth, as demonstrated by this Swan fridge freezer model. Swan has long been a competitor to Smeg when it comes to the classically designed appliances, and this one does not look far off the mark. There is, admittedly, quite a bit less storage, but for less than a quarter of the price, we are pretty sure you could work around that a little bit if the design is the biggest issue. Despite the lack of space on paper, the inside is very roomy, and there is plenty of scope to arrange everything to best suit your lifestyle. The freezer is at the top and the fridge at the bottom, so make sure everyone in the household will be able to access what they need the most before you buy. This cream standalone appliance from Haier (also available in other appealing colours) makes a welcome change from the sea of silver, white and steel we usually see. Split 70/30, it claims you can fit approximately 16 bags of food shopping inside which, although we didn’t test, we can easily believe as it feels very spacious – maybe due to this being an extra tall model. Humidity control keeps everything frozen and prevents a build up of ice, to save you chipping away or running out of room. Both compartments offer a great amount of space, and we particularly liked the large freezer drawers as opposed to separate compartments behind a single door. One of these drawers is a special MyZone design. Simply put, you can customise the temperature (from -3° to +5°C) with one-touch, so you can store foods that need certain care without affecting the rest of the appliance. Perhaps you’ve just done a food shop and need some extra fridge space? Or maybe you’re defrosting some raw meat and don’t like putting it in the fridge? The opportunities are endless. It’s no secret that Smeg products are some of the most stylish kitchen appliances in existence. They have a cool, retro aesthetic, come in a range of unusual colours, and are energy efficient. We love this tasteful cream model from Smeg (available in a few other colours too) as it has a fabulous A+++ rating, spacious compartments and never requires manual defrosting. There’s nothing better than an appliance which does all the hard work for you. The primary appeal of this model is the design and respected Smeg name. It’s fast-chill and fast-freeze functions are also very handy, ensuring that your food reaches the best temperature rapidly. However, there is no getting away from the fact that these famous Smeg products have a hefty price tag. The Samsung RB31FDRNDSA is really everything you could want out of a traditional appliance. It is a standard size at just 59.5 cm across, and so much more appropriate for modest kitchens than big American-style alternatives. It has ample storage space, a chilled water dispenser (but no ice), and handy bottle rack. The external display is a nice touch, too. Considerably more efficient that its American-style counterparts, using approximately two thirds of the amount of energy. The trade-off is that you have less space, but not everybody needs as much. This product would still be perfectly fine for a family or 2-3 people sharing. A modern model with built-in chilled water dispenser from this reliable brand. Here we attempt to answer this question for you. The answer of course depends largely on your requirements and so is different for everybody. We’ve listed some of the most important features you’ll want to consider when shopping around. There are many different varieties of fridge, but they can be boiled down to four main styles. Each has certain benefits and disadvantages. This is where the freezer sits on top, with the fridge located below. The fridge sits above, with the freezer at the bottom. As the name suggests, this fridge-freezer has two doors which open outwards, and the freezer is located at the bottom or in one of the halves. Again with this option there are two doors that open outwards, but this time the freezer and fridge are found alongside each other. A free-standing appliance is the most common type of this appliance. They aren’t designed to hide behind your kitchen units, so you’ll find a variety of shapes, sizes and styles. They are generally less expensive and simpler to install than integrated units, and are easier to move if required. As a result, their appearance is sometimes not as seamless with the rest of your kitchen and you may have to do some shopping around to find the perfect match. Integrated models are built in, with a front panel that seamlessly matches the rest of your kitchen. The appliances themselves are hidden from view unless opened. They are slimmer than traditional fridges and take up less space – but the downside is they can cost more to buy and run. While they are becoming more popular, integrated models are still hugely outsold by the freestanding fridge, so there is a smaller range available. But don’t let that put you off – if you’ve got your heart set on integrated fridge freezers that perfectly blends in with your kitchen suite, there are still some great options out there.